You might have heard that gardeners may live longer than non-gardeners. While a lot of the evidence is anecdotal, I believe it! It makes sense that gardening is beneficial to our health because it’s a reason to spend time outdoors and eat more veggies while you’re at it. 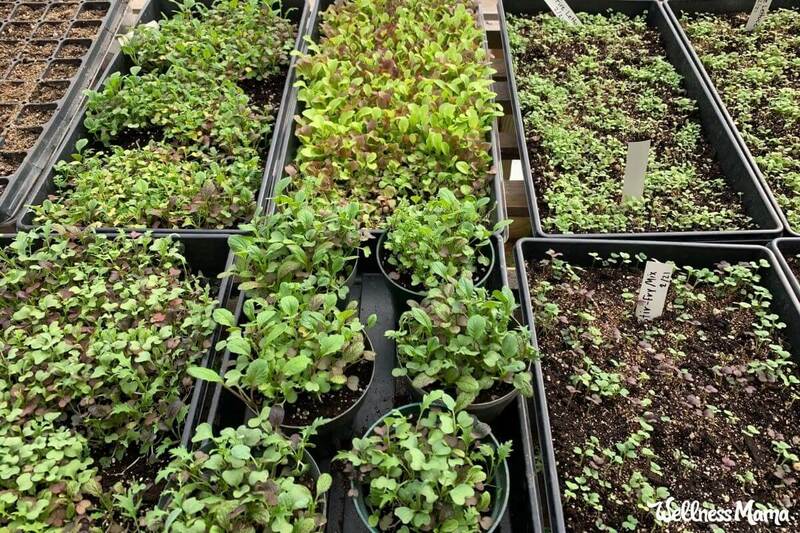 If you’re looking to start your own garden for healthy produce, you may get the idea to try starting seeds indoors rather than buying them from your local greenhouse. It saves money over buying more mature plants and is a great learning experience for the kids (and the adults too!). I’ve had wins and losses when it comes to starting my own seedlings, but if there’s one thing I’ve learned about gardening, it’s that there’s no better way to learn it than to just roll up your sleeves… and get dirty! Depending on where you live, you can start many seeds inside to extend the growing season. On the other hand, there are some seeds that do best directly sowed into the ground. If you’re new to gardening, the information on the seed packet is a handy resource. There will be instructions for planting and it will mention whether the seeds should be sowed directly outside or planted indoors before being moved outside. Fruiting plants like tomatoes, eggplant, peppers, squash, etc. Luckily, most seed packets will tell you if you should start your seeds inside or direct sow them, taking the guesswork out of it for you. If you’re a beginner, opt for seed packets that give extensive information on the packet. Knowing how much to grow is a really individual thing and many people don’t get it right even after years of experience. But to give you a roundabout answer you can look at this calculator to see how many seeds you should plant per person in your family for each kind of plant. Most seed isn’t expensive and a little goes a long way, so don’t stress too much about this part. After all, if you end up with too many seedlings to fit in your square foot garden, the worst that can happen is that you have gifts for your friends and family members! I’ve even sold my extra seedlings or offered them for free on local swap websites before. It can be a great way to connect with fellow gardeners in your area. The timing of starting seeds indoors is going to be different for everyone depending on location. Typically you will look at your last frost date in your area to determine when you need to start your seeds. Go to this website and type in your location. It will give your last frost date for the season. When you know your frost-free date, you can plug it into this tool to get a list of vegetable plants and when they need to be started indoors. Your seed packets should also tell you how many weeks before the last frost you need to start your seeds inside, so do some quick math and plot out the dates for sowing seed. Starter pots – You can use peat pots, recycled containers, or even leftover eggshells. Just make sure there is drainage at the bottom. For tomatoes, squash, and larger plants, you will want to start in larger 4-inch pots (or transplant later on). Now, to get to work! To speed up the process, you can pre-germinate the seeds in unbleached coffee filters or paper towels in unzipped plastic bags. Just place about 10 seeds with space in between on 1 unbleached coffee filter. Put another coffee filter on top and get damp with warm water. Fold in half and put in a quart size or larger plastic bag, but don’t zip it! Place the bag on a plate and put on top of your fridge or in another slightly warm place. Keyword: warm! In 2-3 days, you should see tiny sprouts coming from the seeds. At this point, plant seeds in small pots indoors using tweezers. Keep pots indoors near a window (south-facing if possible), keep moist, and watch them grow! Choose the seeds that you’re going to plant (I talk about how to do that below). There are many reputable places to get quality seeds. I have ordered variety packs on Amazon and had success. Johnny’s Seeds sells non-GMO seed in larger quantities and is also a wealth of information for new gardeners. Fill the starter pots with dampened (not wet) seed starting mix. Seed starting mix is lighter than potting soil or garden soil. This allows the seeds to grow deep roots with minimal effort. Follow the directions on your seed packet. It should tell you how deep to plant the seeds and how far apart. In starter pots, you will usually plant 1-3 seeds per pot. You can also plant seeds in trays and transplant them to larger pots later. As you go, write down the name and variety of the seed on a marker and put it in the pot or tray. Take it from me, you will really regret it if you skip this step! I also recommend writing down the date planted and days to maturity (which will be listed on the seed packet). Transfer this marker to the garden when you transplant. Once planted, mist the pots with water (a spray bottle works well) until the soil is wet but not soggy. Keep your pots or trays warm and moist until the first tiny green shoots start to show. Until this happens no light is needed, so opt for a spot with a consistent warm temperature even if it’s not by a window. (And also where you won’t forget to check on the plants!) Tip: Keep soil moist by covering the pots or trays with some damp cheesecloth or lightweight beeswax cloth, removing often to check for green shoots. When growth is visible, move the pots or trays in a sunny window with at least eight hours of sun or under a grow light. Keep spraying the pots until plants are well established. Also, make sure there is good air circulation to avoid mold, mildew, or a fungal disease called damping-off. Plants that like warmer temperatures (~60-80 degrees) for germinating include tomatoes, peppers, and squash. Keep these plants warm the first few days after planting, using a heat mat if necessary. 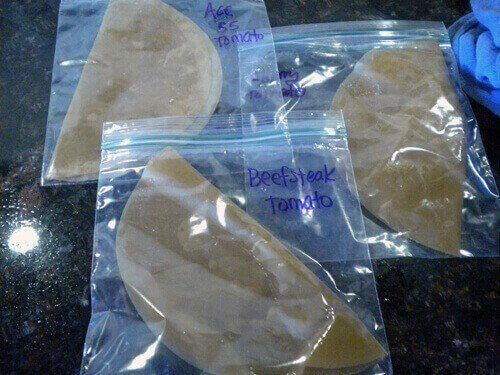 (These are also useful for fermenting kombucha or yogurt! Plants that need cooler temperatures (~50 degrees) include lettuces, greens, and peas. These usually grow well in a room temperature house without any extra warmth. Tip: A good rule of thumb to tell what temperature your seeds need for germination is to look at when they can be transplanted outside. Plants that can be set out near the last frost likely need a lower germination temperature. The plants that must wait 4-6 weeks (or longer) after the last frost to go outside likely need a higher germination temperature. If you’re a beginner you may feel overwhelmed when it comes to choosing which plants to start with. My best tip here: it’s a good idea to start slow and learn with just a few plants. Choose vegetables that are expensive to buy in the grocery store (like greens). Grow plants that do well in your climate (the seed packet or catalog should tell you this information). I recommend picking no more than 10 different plants to grow. This will help you learn about the ones you are growing and become an expert in those plants before expanding to more. Remember, it’s not just starting the seeds and caring for the young seedlings you need to worry about. You are also responsible for transplanting, caring for the garden, harvesting, and preserving your plants! If you prefer a one-stop shop approach, this all-in-one veggie variety pack has most of the suggestions above and sticks to the rule of 10 or less. Follow these tips for transplanting and watch your babies grow! Starting seeds indoors is the best way to begin an abundant garden. It helps extend the growing season and ensures that your plants will survive when you do put them outside. Even beginners can learn to start seeds indoors for an amazing vegetable garden. Have you started any seeds yet? What are your tips and tricks?